This Instant Pot recipe can help you easily make juicy delicious Whole Chicken at home. Season the chicken thoroughly with salt and sugar. Sprinkle 1 teaspoon of salt into the bottom of the instant pot. Pour the wine, water or broth and soy sauce into the cooker, and add the chicken. 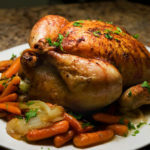 Choose POULTRY and cook on HIGH pressure for 15 minutes. When time is up, flip the chicken, and push POULTRY again. Let the pressure come down naturally before opening the cooker. Serve chicken pieces with green onion on top and any side dishes you would like.